I am using ASP.NET Web API project but same steps can be applied on other ASP.NET projects also. In above code, On SqlDependency OnChange event, we are calling JobHub’s show method to refresh the grid. We will create Hub in next step. Open “http://yourserver/app/home/status” URL and test it. 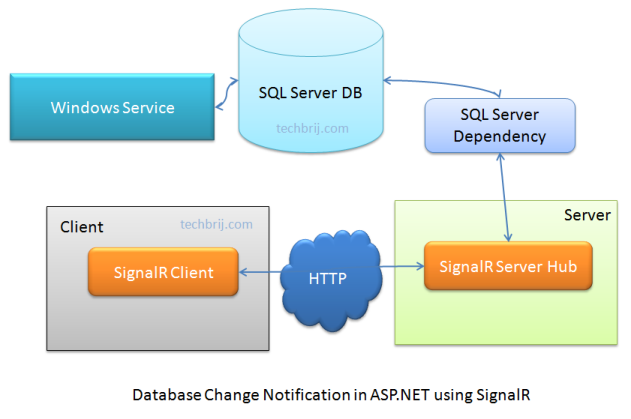 On database change, dependency_OnChange method is triggered which calls Show method of signalR Hub. It notifies and triggers displayStatus method on client side to reset data. Only thing is on Notification all dB table records are fetched calling get method, how to get only the new row Inserted in to dB table. It Goes to Infinite Loop Help ME .!!! Message is showing again and again please help ..!! In Debug mode my dependency_OnChange method firing continuously on Database change can you explain it is normal behaviour or it should not happen? help me understand this ,i also have this problem. using web api 2 project for services and mvc 5 project as client app,my hub is at web api now i want to call a hub method from client application. #1. i am not able to generate automatic proxy probably because of separate projects. #2. if i use without generated proxy method ,server method dosent gets called , i get error at console log that ,error calling server method. First check whether “job” variable is undefined or not. I think it is undefined in your case. One of the solution for your issue is to add ” ” to the head tag after signal ir reference. Are you using Entity Framework or ADO.NET in your project ? can we implement this in ado .net? Up to how many rows, in the sql server database, will these updates truly appear to be real-time? I added 10,000 rows to my database and whenever I add a new record, it takes up to 3 – 4 seconds to appear, on the table. Also, when I press F12, in Mozilla to open firebug, I see GET poll?transport=longPolling&connectionToken.. I thought SignalR would leverage web sockets? Brij, do you have a downloadable zip file for this project? This is a nice tutorial. But can you please provide the code for other asp.net web site(except mvc). I’m totally new in signalr. And I don’t know mvc. I have created a asp.net website and want to add that feature intomy web site. So please help me to do this. i did not know how i execute 2 nd step….Please help..
am new to signal R. the hub is started successfully.i checked using debug mode, when the cursor point comes to line no 35, its jumbing out of that ajax function. Pls any one can give me a solution for this. Does enabling service broker at database level has any performance impact? Can any one help me to know more details about this? I have problems with the statement GRANT SUBSCRIBE QUERY NOTIFICATIONS TO “DomainASPNET”, the sql server tell me “Cannot grant, deny, or revoke permissions to sa, dbo, entity owner, information_schema, sys, or yourself.” How can I fix it? First of all, thank you for the sample codes! I am working on a project base on the sample codes you provided. I observed when more than one instance of page was opened, the number of AJAX calls to get the data increases with each update to the table. Refer to screen shot. After several updates to the table, with two instances of the same page opened, a single update to table now made 256 AJAX calls to get data. Did you observe similar behavior in your solution? can i have the code of this sample! Hi have you get the solution? I am facing same issue. I go through your article and it looks file but i have few question on this. 1) Polling for database changes with SqlDependency is good option when huge number of client is changing data in table ? JobHub is name of class and not static class so i like to know how anyone can call `JobHub.Show();` from out side ?? 3) what is GlobalHost class and when it is used ? 4) the article code related issue. see the jquery code in view which fetch data and populate table. first time when page load suppose there is 5 records exist in table so 5 records will be passed to jquery code and it will just display those 5 records but when any existing data will be change in table then what will happen ?? the only changed rows will come to client side or all data including changed data will come to client side ? if you say only changed data will come . it is shown in the video data is changed one by one and change is reflecting at client end but if you see the jquery code it just empty the table first and build the table again. so my question is if data change and only change data will come then one row should display at client side…. am i right. but in video the change is showing as well as other data is too in table. can anybody explain step 1 and 2. how to implement these step. It’s Great to work, But I have an issue. Every Time when I changing in the database, every time the request to get the data from the database is increasing …. I check this through Make a Breakpoint on GetData() Method.. It is firing more than the browser open.. The reason some processes only fire once is because the SQLDependency call may not have time to complete. It’s a round trip from the process to the SQL service and back. So insert a Sleep(200) right after the call “SqlDependency dependency = new SqlDependency(command);” and you’ll probably give the system enough time to register the dependency. what is domain and ASPNET, how i can retrieve them?? This is best example you have provided, But I tried to do same thing with ASP.NET not MVC project, It not work for me. OnChanged Event of SQLDependancy is not firing. 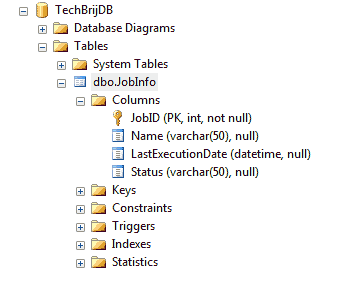 sql dependency does not work on system tables eg:dbo.sysjobactivity…how can i notify job status using sqldependency ? Somehow this works only once for me. The first change in the db is pushed, after that nothing happens. After reloading the page (F5) it works again for one time. Any idea what could be the reason for that ? if reload the page (F5), it works multiple events(dependency.OnChang). How is url: ‘../api/values’ (used in Ajax call of getData function) being resolved? If i have to change the url to some other controller where should I Specify it? I am Impressed with the SignalR – SQL Dependency working together to do a Server push on all the clients. How ever I have noticed that OnChangeEvent handler will not get registered untill the command.ExecuteReader() is executed. If i don’t want to Execute the Select statement (Query), but only wanted to get notified about the changes, how can I avoid using command.ExecuteReader() ? so what is the problem plz help!!! I get it to work! thanks a lot! but is it possible to include update SQL statement? if I add where condition to my select will that effect the efficiency of the system? hey, it’s not working.. Could you help me. 2) Make sure you use fully qualified column names (Ex: Select [col_1],[col_2] From [dbo].[chat]). However, I’m having an issue with your example. Any ideas as to where to troubleshoot? your solution seems to not be working with the sqldependency but instead just polls constantly. i’ve stepped into it with a debug statement and see an infinite loop occuring with the line: JobHub.Show() which in turn starts the cycle again. if you were to look at the sqldepedency arg and look at its info property, it’ll have a info type of invalid. if you were to check on that and then if it’s not invalid fire JobHub.Show() then it’ll work correctly… however, im having issues setting up my sqldependency object to fire correctly. There isn’t an answer for this yet, i dont understand the infinite looping aside the fact that when the method where the sqldependency resides has been invoked, it invokes the dependency action again, how to resolve this problem already. So, if your hub has 100 clients, whenever the SqlDependency Change notification fires, the change handler tells your SignalR hub to tell all 100 of its clients to each call back to the server asking for all of the data. I understand this is just a proof of concept, but this seems pretty chatty. Wouldn’t a better design to be to have the change handler get all the data once, then pass it to the SignalR hub, which would, in turn, broadcast the data out to all the clients, rather than having them each go back and as the server for the data? Also, when I tried to do this, I would always run into trouble reacting to IIS process recycles. If I’m parsing your code correctly, if your thread pool dies/resets/recycles, there is nothing that re-registers the SqlDependency (nothing calls JobRepository.GetData()), and you would have nothing with a change handler listening for changes. it’s not very chatty. it has a serious memory leak. it registers `dependency_OnChange` per each request and it will never unregister it. This is happy-path-coding. What if your DB is down??? No ExceptionHandling in the repository, So a Job to do….